The Left has been eager to show it can build a winning coalition for 2020 and beyond. But that didn't happen in the midterms. Progressives were hoping Tuesday's elections would finally give them definitive proof that Democrats can run and win on unapologetically liberal issues in swing districts and states. Despite a good night for congressional Democrats overall, nearly all of national progressive groups' star candidates fell short in their contests in red or purple districts and states, potentially slowing the momentum the emboldened left had enjoyed since Hillary Clinton's loss two years ago. "Progressives have to really do some hard thinking about the shape of the movement looking at 2020 and beyond," said progressive strategist Jonathan Tasini, adding that while the left had successes in some local races, they struggled in statewide contests. "The failure, for example, of the Ben Jealous campaign in a very Democratic state says both that sticking a simple 'progressive' branding on a candidate's campaign may sustain a small cult, but that isn't enough to win enough elections." Jealous, a former president of the NAACP who championed single-payer health care, never really gained traction against Maryland Republican Gov. Larry Hogan. Other losing progressives included congressional hopefuls like Randy "Ironstache" Bryce, who ran for the Wisconsin seat being vacated by retiring House Speaker Paul Ryan, and both progressive insurgents who won upset victories in primaries earlier this year against Democratic establishment-backed candidates, Kara Eastman in Nebraska and Dana Balter in New York. And Elizabeth Warren protege Katie Porter, a progressive who came out on top in a crowded primary in southern California, is trailing in a too-close-to-call House race, while some candidates who beat progressive-backed candidates in Democratic primaries in places like Kansas and Texas won their races. Sean McElwee, the progressive activist who popularized the call to "abolish ICE," acknowledged that Democrats' biggest successes this cycle came in primaries in safe blue seats, where rising stars like Alexandria Ocasio-Cortez in New York and Ayanna Pressley in Massachusetts ousted longtime Democratic incumbents and cruised to victories Tuesday. "We should really take seriously the idea that the path forward is contesting for power in (primaries in) the deeper bluer seats," said McElwee, who runs the think tank Data for Progress, adding that approach would help progressives form a bulwark in Congress to press their agenda. Moderates can hardly claim to have found a sure-fire recipe for success either after Tuesday night, however. Rep. Beto O’Rourke, D-Texas, who supported impeaching President Donald Trump, came within three percentage points of winning a Senate seat in Texas, which hasn't sent a Democrat to the upper chamber in 30 years. Meanwhile, incumbent Democratic Sens. Joe Donnelly, D-Ind., and Claire McCaskill, D-Mo., who both tacked aggressively to the center, lost by wider margins in friendlier states. And Tennessee Democratic Senate challenger Phil Bredesen, who said he would have voted to confirm Supreme Court Justice Brett Kavanaugh, got trounced by 11 percentage points to an unpopular opponent. Overall, the results offer mixed signals for Democrats, providing just enough evidence for both sides to continue their low-boil civil war. And they wasted no time doing so. "They flipped exactly zero House seats. 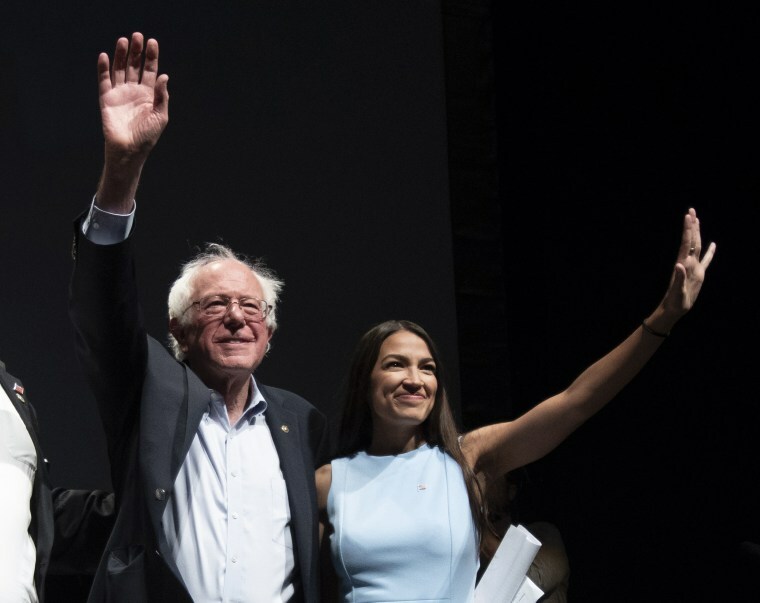 Zero point zero," said Matt Bennett, a senior vice president of the centrist Democratic thank tank Third Way, referring to two prominent progressive groups that emerged from Sen. Bernie Sanders' 2016 presidential bid — Our Revolution and Justice Democrats. Our Revolution did not dispute that figure. Spokesperson Diane May said the group still won at least 67 races overall and noted that two of its endorsed candidates, J.D. Scholten, who challenged Rep. Steve King, R-Iowa, and Liuba Grechen Shirley, who took on Rep. Peter King, R-N.Y., came "very close to unseating incumbents." Still, the incoming class of freshmen Democrats in Congress is likely more liberal than any recent one as the party's center of gravity has shifted decisively to the left. "We saw red-state (Democratic) senators sadly go down to dramatic defeat after hedging on economic populist and racial justice issues — seeming uncomfortable in their own political skin. Yet progressive senators Sherrod Brown and Tammy Baldwin both won re-election by large margins in Trump states by keeping it real," said Adam Green, the co-founder of the group Progressive Change Campaign Committee. When asked to name one new winning candidate that best demonstrates the left's theory of the case, Green paused and said, "That's a good question." He then pointed to data his group compiled that shows the "totality of the actual Democrats who just got elected" embraced progressive ideas. The center of gravity in the party may have shifted left, but whether candidates actually prioritized progressive litmus test issues like Medicare for All in the general election is less clear. Democrats did find unity on once-divisive issues like abortion rights. Ilyse Hogue, the president of NARAL Pro-Choice America, cited as an example Jacky Rosen, who won a Nevada Senate seat Tuesday by ousting Republican incumbent Dean Heller. "I don't think anybody thinks of Jacky as a foaming-at-the-mouth liberal, she just holds the values of reproductive freedom, gun safety and expanding access to healthcare and made her case to the people of Nevada in an authentic way," Hogue said. Rep. Ro Khanna, D-Calif., predicted that his party's 2020 presidential nominee will still end up being a progressive, arguing that voters want candidates who speak boldly. "Look at who the stars were this year," Khanna said, pointing to O’Rourke and gubernatorial candidates Andrew Gillum of Florida and Stacey Abrams of Georgia. "Fine, they all lost by a point or two... But that's where the energy was."